Reports indicate that Boeing will acquire KLX Inc, an aerospace parts distributor, at a price of $3.25 billion. Under the deal Boeing will spin off the energy business of KLX. This is part of the strategy by the biggest planemaker in the world to expand to the spare parts and maintenance business as it enjoys higher margins. The goal of Boeing is to ensure that revenues generated by the planemaker’s services unit are tripled within a decade and reach $50 billion. According to analysts, the ambition of Boeing to dominate services and repairs in the aircraft sector is likely to trigger increased consolidation among the players in the sector who rely on the aftermarket business. Last year for instance B/E Aerospace, the former corporate parent of KLX, was acquired by Rockwell Collins before the latter was acquired by United Technologies. “This deal marks another step forward in Boeing’s ambitious plans to expand its Global Services division… for aerospace suppliers there will probably be fresh concern that this further increases Boeing’s purchasing power, and awareness of the economics in the aero aftermarket,” wrote Vertical Research Partners’ analyst, Robert Stallard, in a note to clients. According to a statement from Boeing cost savings totaling $70 million will be generated by the deal by 2021. Approximately $63 per share will be paid for KLX by Boeing and this will be financed using cash on hand. In its guidance for 2018 Boeing has disclosed that its capital deployment strategy as well as the commitment it made of returning to shareholders free cash flow will not change. Through 2019 the acquisition is expected to earnings-neutral. Since Dennis Muilenburg became the chief executive officer of Boeing in mid-2015 this is the biggest deal he has struck so far. Earlier in the year it was reported that Boeing held preliminary discussions with Woodward Inc, a parts maker. It has also been reported to be in talks with Embraer SA, with a view of forming a joint venture which would hand it control of the commercial jet division of the Brazilian planemaker. 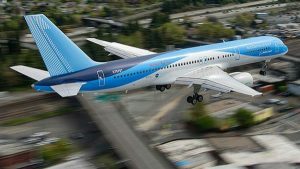 Though the focus remains on organic growth Boeing is also looking at targeted investments and takeovers with a view to rounding out the product portfolio of the Chicago, Illinois-based company. Other areas that Boeing is scouting deals in include avionics and this could see the planemaker take over work which suppliers previously handled. The services division of Boeing was created last year.